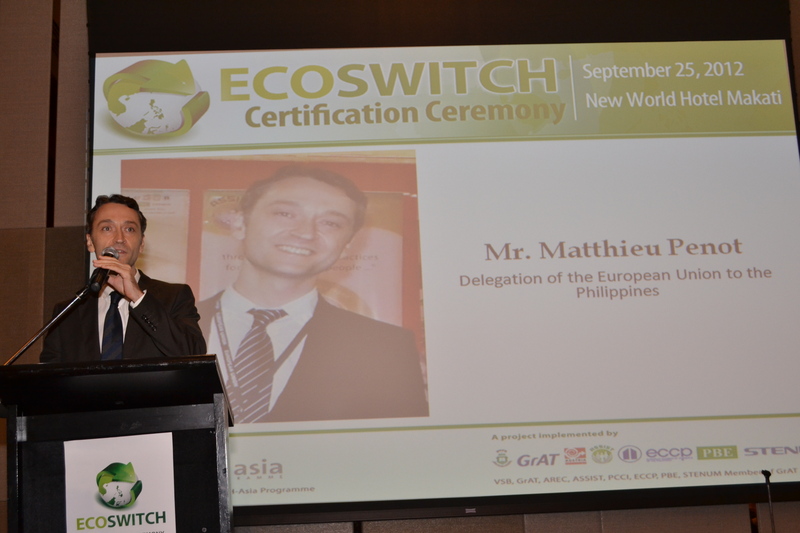 Four hundred local and foreign dignitaries as well as representatives of private companies gathered for the ECOSWITCH Awarding Ceremony held at the New World Hotel in Makati City, Philippines last September 25, 2012. 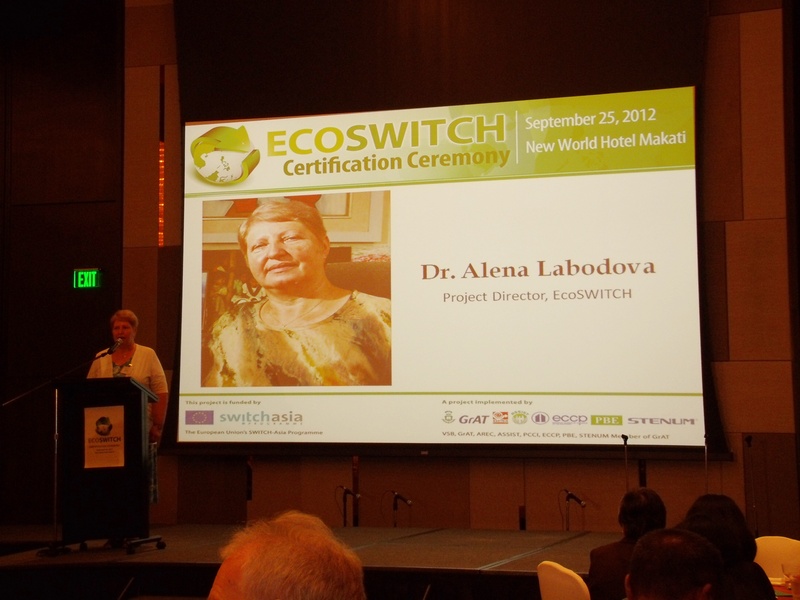 ECOSWITCH Project Director Dr. Alena Labodova formally welcomed the attendees. A total of 150 participating companies received plaques and certification for facilitating the switch in their organization towards more environmentally sustainable operations. The list of awardees includes Goldilocks, Mekeni Food Corporation, Philippine Airlines, Lufthansa Technik, Yokohama Tire Corporation, Panasonic, Toyota Motors, and Mapua Institute of Technology. 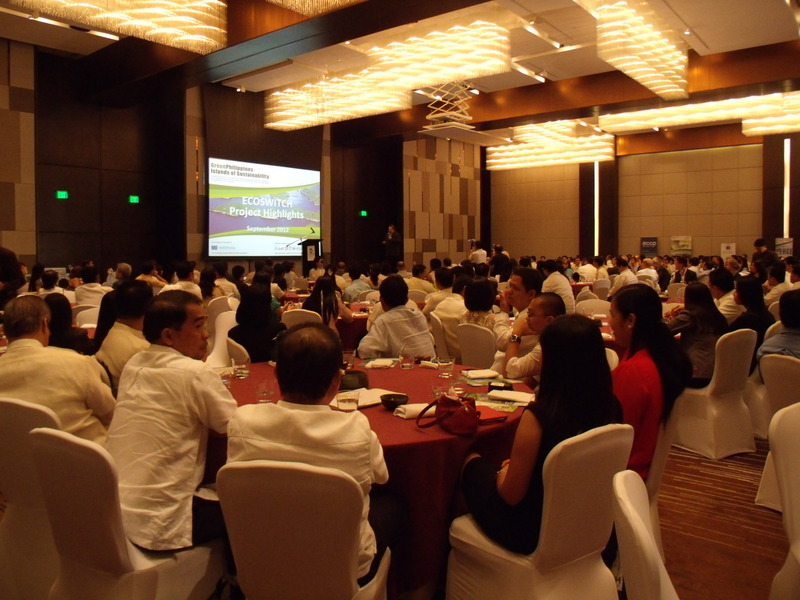 The event marks the end of the second phase of the Green Philippines Islands of Sustainability (GPIoS) Project, an initiative funded by the European Union’s SWITCH Asia program. GPIoS seeks to contribute to an improved environmental and sustainable industrial development of Metro Manila and CALABARZON regions by introducing measures to save on energy, cut down on wastage and promote best environmental practices within organizations. 400 people from the public and private sectors convened for the event. GPIoS is led by the Technical University of Ostrava (VSB), Czech Republic, Center for Appropriate Technology (GrAT), Austria, Australia Recycling (AREC), Asia Society for Social Improvement and Sustainable Transformation (ASSIST), European Chamber of Commerce of the Philippines, Philippine Business for the Environment, Philippine Chamber of Commerce and Industries, and STENUM. Project Directors Thomas Dielacher and Alena Labodova led the event, along with Project and Grants Management Associate Juvy Jem Perez, and Technical Consultants Wilson Baldonado, Joshua Rey Albarina Rolando Sumabat, Helen Joyce Basco, Maricris Elemos, Arlyn Gonzales and Mariefe Kim. The Project Team closely worked with the companies in implementing the energy efficiency and waste management measures. Keynote Speaker Neri Acosta, Presidential Adviser for Environmental Protection and General Manager of Laguna Lake Development Authority lauded the initiative, while also expressing the government’s commitment to environmental protection. Mr. Matthieu Penot of the European Union Delegation to the Philippines commended the businesses and the Project Team for their contributions to greening the business sector. He was joined by other members of the delegation, Mag. Wilhelm Donko, the Ambassador of Austria to the Philippines, Mag. Isabel Schmiedbauer, Commercial Attache, Austrian Embassy; Gabriel Zobl-Kratschmann, Vice Consul at the Austrian Embassy; and RNDr. Jakob Cerny of Czech Republic Embassy. Other presentors of the award were Atty. Juan Miguel Cuna, Director of the Department of Environment and Natural Resources – Environmental Management Bureau; Mr. Arnel Go, Manager at ASSIST; Mr. Bobby Banaag of Plantersbank and Ms. Teresa Pacis, Vice President for Corporate Affairs, GMA Network. The ceremony also featured partnership testimonials from Ms. Susan Benitez, President of Pollution Control Association of the Philippines (PCAPI); Mr. June Alvarez, Executive Director of the Philippine Center for Environmental Protection and Sustainable Development, Inc. (PCEPSDI) and Ms. Victoria Tambunting-Alfonso, Vice President of the Plantersbank. 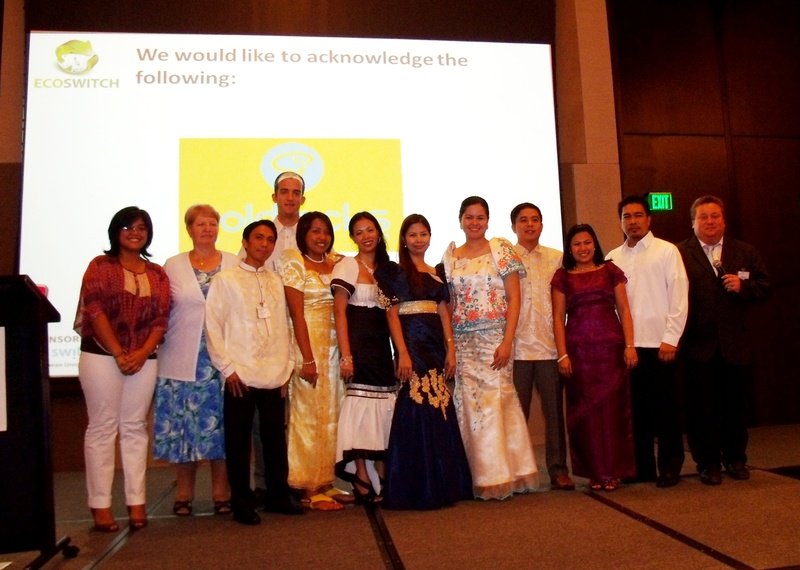 Mr. Matthieu Penot of the European Union Delegation to the Philippines graced the event. ECOSWITCH Planet Award for Waste Minimization: United Pulp & Paper Company, Inc.
ECOSWITCH Green Coin Award: United Pulp & Paper Company, Inc.
See GPIoS Facebook page for more official photos.